More than three hundred short brain exercises for word puzzle lovers. 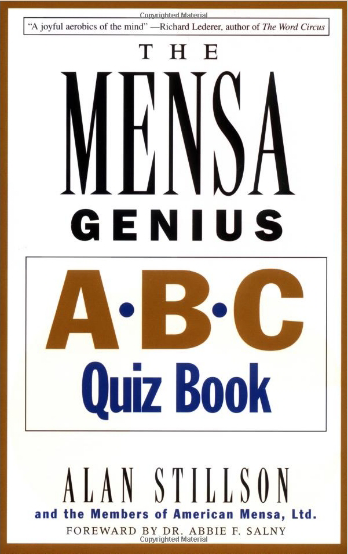 Most can be done without a pencil – 176 pages - 8.27 by 5.40 – compare your answers with members of American Mensa, the renowned high-IQ society. In today’s busy world, the potential pleasure of solving a time-consuming puzzle is often lost to other demands. That’s why this book is designed so that you can enjoy one puzzle at a time, or as many as you want to do. Most of the puzzles in this book can be completed in less than a minute – either you’ll figure one out or you’ll figure out that you won’t figure it out without some research. Only a few require writing anything down. Yes, t’s possible to experience the joy of puzzles when you want and in as little or as much time as you choose. Puzzles range from moderately challenging to very challenging. To hold down a cow or a horse. And I’m constantly working, of course. He came to the beach a pale man, but went home as a __________.